from 2 Pcs. from 3 Pcs. from 6 Pcs. World's first Beck Zapper with LCD display. Our topseller with rapidly growing worldwide customer base. Exclusive dealers wanted! Check out the link "DETAILED INFORMATIONS on this product" and "More infos (PDF)" for all the improvements of the LCD version versus the standard model which will soon be discontinued. The miniZAP® LCD is a Dr. Robert C. Beck Zapper and the world's smallest yet most advanced blood zapper (blood purifier device). The miniZAP® LCD is carried like a wrist watch and sets new standards in regard to flexibility, economy and comfort. Completely Made in Germany. Contrary to the so called "Clark Zapper" the miniZAP® LCD is a pure "Beck Zapper" and is not based on bioresonance or radionics but on direct electrification of the blood stream. "Cool and unobtrusive to wear." With a 1000 µA output current the miniZAP LCD is a powerful device (600 µA are already the pain limit, even with conductivity gel). 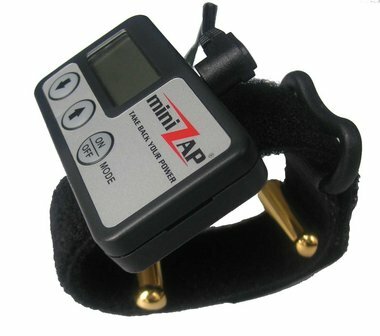 The miniZAP® according to Dr. Beck is a microprocessor-controlled Beck Zapper (blood zapper) which emanates subtle current impulses through two gold electrodes via the veins of the wrist into the body in order to inactivate parasites (viruses, bacteria, fungals) and to boost the immune system. Often the Beck zapper is confused with the "Clark Zapper", the latter, however, is based on a different principle: A Clark zapper basically is a bioresonance or radionic device which does not release a current (µA - micro Ampere) into the blood but rather a variety of frequencies between 30-400 kHz. The Clark Zapper is not based on patented research like the miniZAP®. We buy every old zapper (also Clark Zapper) if you buy a new miniZAP LCD from us. With reception of your zapper you will get a shop voucher. For old miniZAP standard devices we pay up to 150.00 ? (incl. tax, depending on version, condition and auxiliaries). For our topseller miniZAP® with rapidly growing customer base we are looking world wide for distributors. Use our affiliate program. Sure! If you don?t know a domestic dealer, we can ship directly to you world-wide in more than 200 countries, tax free, via DHL. 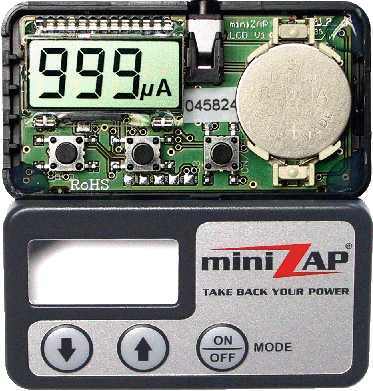 The miniZAP® LCD costs 299.00 EUR incl. tax or 251 EUR net. You can convert this into your currency with a conversion rate calculator. Freight is about 31.00 EUR net. The 269.10 are only displayed on the category?s page. It is the lowest offer for a unit, if bought in a set of 3. If you click on the item details you?ll see the discount table. The 299.00 on checkout is the single unit price, including tax. Once you enter a non-EU-country (e.g. USA) and/or your VAT#, the cart will show the tax free price on the final page. Can I purchase the battery and gel elsewhere? What are their costs? You can get the batteries everywhere as they are standard. The gel is special quality but you can use ordinary one, too. We recommend to order 2-3 extra batteries and gel tubes. Please look up the costs in the shop. Where do I look up the total costs? 5 years for the miniZAP ®, 1 year for the remaining parts. Send it back to NU LIFE as registered letter. We?ll repair it instantly and ship it back to you free of costs (should it be a warranty case). About 10-12 working days. If needed, we can also deliver within 24 - 48 hrs by FedEx. Is the zapper?s manual in English? Are there any auxiliary products? Special electrode gel with extra high conductivity and low dropping behaviour.